This rectangular church, like most, is not the first near the site but the exterior in general remains in a state of remarkable preservation. It is located a half-mile or so to the east of Route 5t in a grove of trees beyond a brick and iron gateway. A colonial cemetery surrounds the church and the later, but matching, rectory buildings within the churchyard. The parish itself is one of the oldest in America, dating from the mid 1620s and, in the early days, encompassed the land on both sides of the river until the establishment of parishes on the other side of the river. Most likely the present edifice was moved after permanent churches were built in surrounding areas. The walls are laid in Flemish bond with glazing on all sides with a two-row layer of English bond in the very shallow water table whose top row is beveled. It is of average size – 60’ x 28’ and has clipped gables with a cedar shake roof as most churches originally did. There is rubbed brick at all four corners and around the windows. The west doorway was repaired in 1956 and is obviously of new brick while the arches above the windows were repointed in rowlocks that do not match the colonial brick. Rawlings considers the rubbed brick throughout the structure similar to that of Bruton Parish Church (1964 117). Queen closers are used are corners and windows. The window above the west door is inserted on what looks like a larger window (to my untrained eye), but the greatest changes are on the east façade that seems to have three openings but at present only one narrow window that is not at all colonial character. The greatest changes are in the interior that is still one large room with a gallery on the west end and low slip pews with doors that are a post Civil War alteration due to Yankee destruction of the interior. In 1867 the east end was altered to make a deep chancel with small vestry rooms on each side of it. The Ten Commandments are posted to the side of the narrow window with a communion table and an altar rail before it. On the north side of the chancel end is a stone baptismal font; the pulpit, more correctly a rostrum, is on the south side. I wonder about the windows. Rawlings does not mention them, but the mullions, particularly the y-tracery elements at the top do not seem colonial. He also mentions the lack of clipped gables, so the roof was redone after 1963? One element of the roof’s restoration that seems curious to my eye is the height of the windows. They are so high as to actually touch the eaves that are decorated with a dental molding that seems quite new. Did the parish lower the eaves with the clipped gables were restored? All in all, this a pleasant edifice in an equally pleasant setting and well worth a hour or two visit; be sure to examine the graveyard as well as the church. This is the third church of the Lynnhaven Parish. The first church was most likely had wooden frame construction and eroded so that little is left except part of its cemetery on the Western Branch of the Lynnhaven River. (I believe that recently some submerged headstones have bee found?) 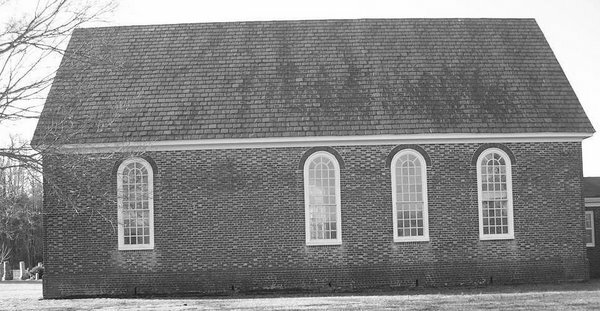 The 2nd church’s site is not mentioned by Rawlings or the church site, but it apparently proved too small for the congregation, and the present edifice was erected in 1736. I seem to recall the minister to whom I talked saying that the second church was near the present one? The name Old Donation refers to the gift of the Rev. Dickson of his slaves and property to the church which used it as a free school for orphan boys. The church is 65’ x 30’, so it is a tad larger than the average colonial one and laid with English bond in the water table and Flemish bond above it. The walls are 18” thick and, according to Rawlings, were originally higher by thirteen courses than they are presently. The walls show much evidence of rebuilding from an 1882 forest fire that destroyed all but the walls. A picture posted on the church’s web site shows utter destruction. http://www.olddonation.org/history.htm. The 1912 reconstruction of the church greatly altered its colonial character by using glaringly different brick and adding an entrance door (reminiscent of Upper Chapel, Middlesex) and a southern vestry addition. There is a dating brick by the western doorway with the year 1736 on it. The windows are the area of principal interest as the small windows in the northern and southern walls were inserted to accommodate the construction of private hanging pews for wealthy members of the congregation. What is surprising is that there are so many of them. Upton cites concerns that such windows caused arguments within congregations due to the blocking of light to the rest of the parishioners (141). I’m going to return and measure the height of the windows; they seem to be shorter that those of contemporary churches making the interior seem dim compared to churches such as Abingdon or Merchant’s Hope with similar shaped windows. As I recall, the windows of Upper Chapel, Middlesex were purposively shortened in a late nineteenth century restoration. The chancel windows, like many I have observed, are bricked up, apparently a relatively common practice in restorations. The interior is plastered with beveled window openings while the chancel, vestry door, and pew arrangement is clearly nineteenth-early twentieth century in style. 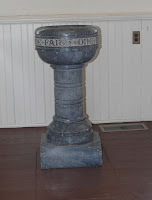 The baptismal font of a reddish marble was being used as a boat anchor in the nearby creek, and there are black and white pictures of the communion silver that is used for special occasions. All in all, the church has lost the definable simplicity and classical balance in its appearance, but at least it is an active congregation that relished the use of its original building. We attended a free concert given on eighteenth century instruments. Tom Marshall from William and Mary who played harpsichord and organ as well as the oboist who played (I can’t recall his name) were splendid and Dr. Marshall commented that the size and reflective walls of the church give it excellent acoustics. Don’t miss the opportunity to attend a concert if you see it advertised.